Darlington is known for the output of its workshops. Cleveland Bridge, a company based in the town since the 1870s, counts among its projects the Sydney Harbour Bridge, the Bosphorus Bridge in Istanbul and London’s Thames Flood Barrier and Shard tower. 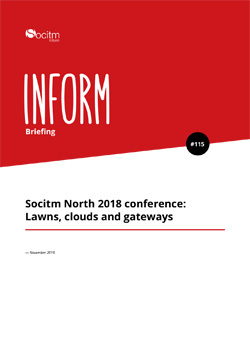 So it was appropriate that Socitm’s North 2018 conference, held at Blackwell Grange Hotel in Darlington on 18 October, included numerous workshops – although these were the kind that involved talking rather than engineering. Attendees heard about the Great North Care Record’s success in signing up every GP in the north-east of England to allow viewing of their records by other health and social care professionals. Socitm’s Nadira Hussain discussed the society’s efforts to develop more of its members into technology leaders, and Emma Marshall of Chorley Council reported on how it has used $20,000 of Amazon Web Services credits – won through Socitm’s first Pioneer Challenge competition – to run a full test of its new disaster recovery systems.